The frontier land in the desert, the last bit of North American soil and rocks, the tall cliffs is where the greenish Rio Grande calmly slithers against the massive mountains separating the two lands, Mexico and the USA. 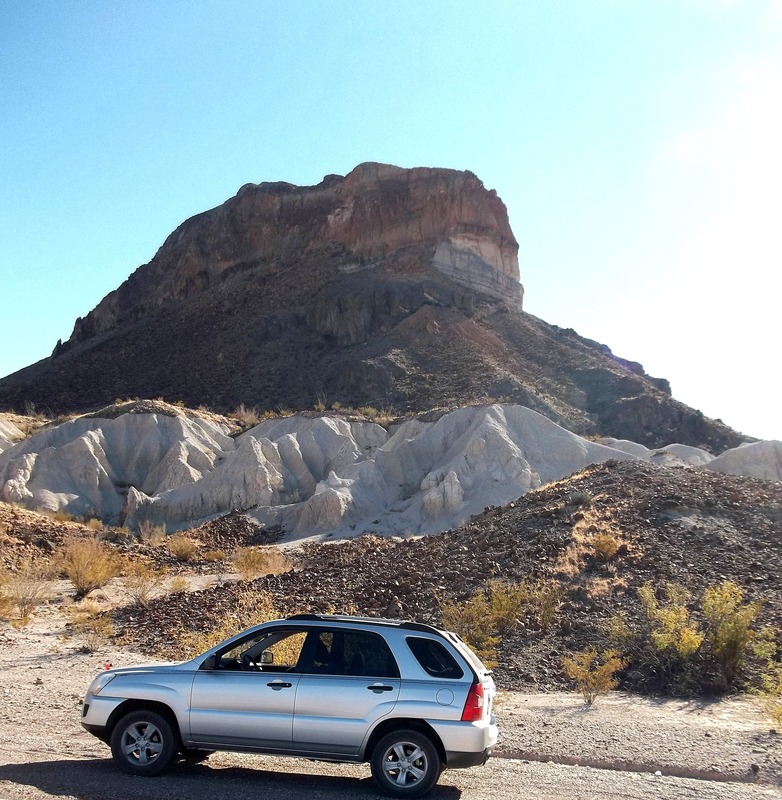 The frontier land in the desert, the last bit of North American soil and rocks, the tall cliffs is where the greenish Rio Grande calmly slithers against the massive mountains separating the two lands, Mexico and the USA. 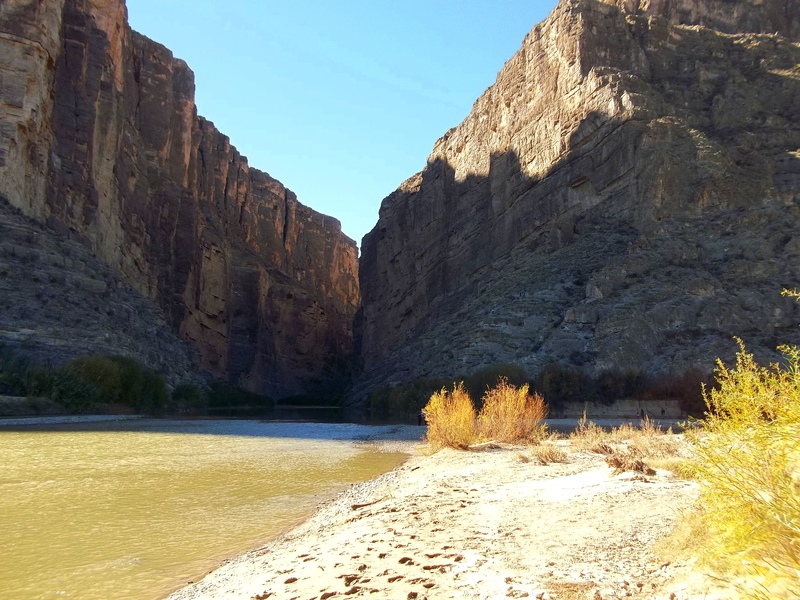 There is no view to be seen of the other side at this particular point where we stopped, at the Santa Elena Canyon. A sliver of opening in-between the two cliffs allows for some light and the river to pass through, but not much more. One can imagine desperate immigrants trying to canoe their way into the country of their dreams. But border patrol is everywhere inside the territory, watchful eagle eyes trained to recognize what does not fit into the rough landscape. The beach of gravel and mud allows us to get close to the rock wall, so tall that by 3 p.m., the sun is blocked for the walkers down the mountain. The river is icy cold and murky, not very inviting. After you drive hours and hours of flat interstate with, surprise! No gas stations and no food (a rarity in the US), you finally start to see the brown mountains lining up in your view, and then you turn down South to be only surrounded by rounded domes of every heights. Some funny shapes, mostly of dark colors, made of boulders sometimes feeling like falling down towards the road, I was surprised of the colors of the landscape. Not green and forest-like, nor yellow and sandy, but more like an ancient planet of dead rocks and toned down colors, with no trees, no flowers, no water, and no life it seems. A beautiful and unfamiliar environment. We drove all day inside the vast park, stopping at all major heights and peaks, visiting the funny no-bottom toilets sporadically placed by rangers. There are a few visitors centers selling the usual chips and cookies, water (five gallons recommended per person per day while visiting the park) and sodas. Not much more. This is not the Grand Canyon store. I liked the scarcity of human traces inside this park, not much tourists, we rarely saw any people. We really appreciated the silence, the shadows on the mountains, the rarity of civilization -- this was really a trip to another planet, or at the very least, to a very empty corner of our country. This is bear territory and the rubbish bins installed to deter the animals are also quite efficient at preventing humans to open them, we found. After leaving the park at the end of the day, we had to go through an official border patrol control station, smack in the middle of nowhere, with serious men in uniform and their drug-sniffing dogs. We pulled over slowly and when asked which country we were citizens of, I quickly answered: Texas. After a few seconds and a laugh from the officer, I added: United States... and we were on our way. My daughter said she saw the black dogs circling the car wagging their tails, probably upset we only had regular food in the vehicle. 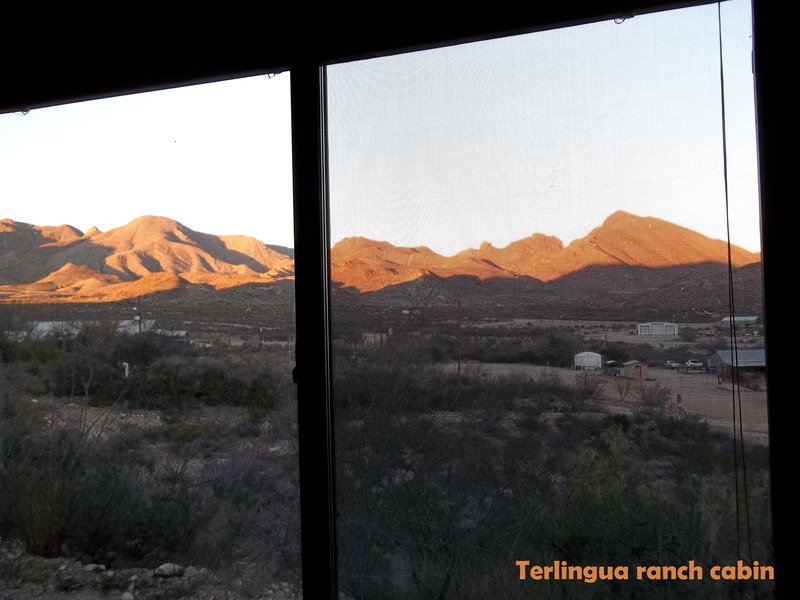 The hiking day was exhausting and we were glad to finally reach our cabin at the Terlingua Ranch, where the most sumptuous of sunset treated us to a divine show of pinks and oranges turning into purple and finally brown, when the dark mountains disappeared into a wall of blackness against the starry sky. The ranch had a wonderful homemade dinner by the fire, where all the comfort foods were just what we needed. 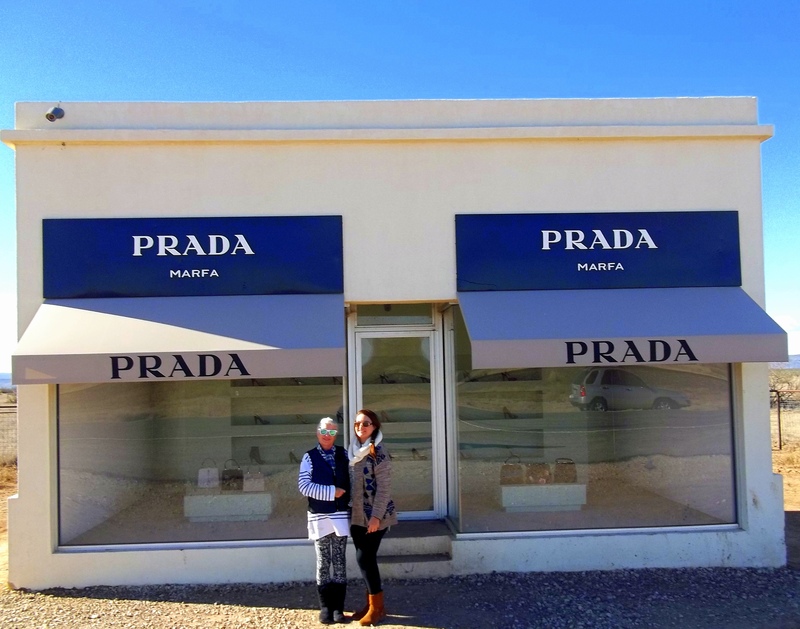 The next day, we drove to Marfa for the two things the tiny town is famous for: the lights and the famed Prada Store. I was a little skeptical about those so-called mystical lights: are they really aliens putting-on a show for us? Or simply bizarre gas phenomenon coming out only at night? We were warned that the so-called Marfa Lights could be a figment of some stoner one evening, or possibly a trick played by the eyes once the night had set dark - or maybe even cars headlights coming from a spot where there are no roads. In any case, the lady at our hotel swore she saw 12 of them once. 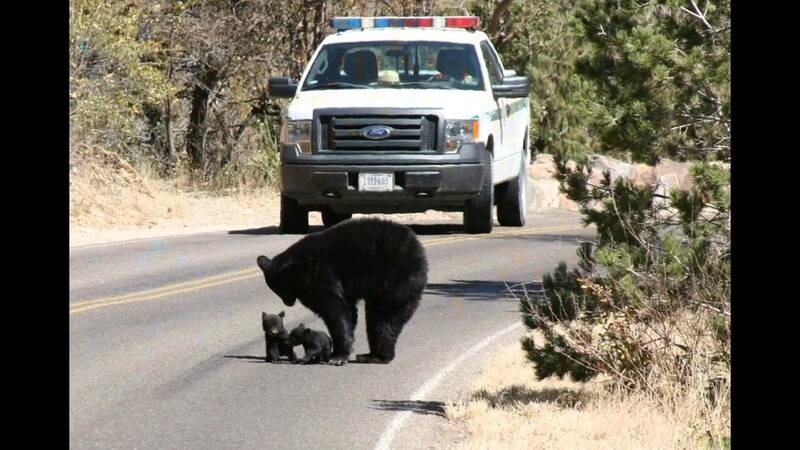 We were lucky to see three. One was going up and down; the other two on the horizon were coming together and separating again, like magnets having fun. At first, we did not know what to make of them. They did look like headlights, but headlights do not dance in the sky, or do they? The theories about alien signs is also one of the version people explain the un-explainable. The lights were round like globes and far away from us, on the line right before the eyes no longer see. A red light beacon seems to indicate where to look, and that is a remnant of an old airstrip the military left behind. Apparently, secret landings have kept the beacon useful until now. 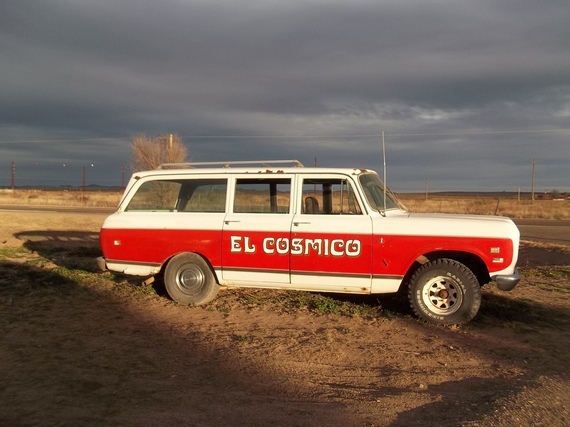 This is the main attraction in Marfa, and tourists will keep on coming, at least as long as the strange lights will too. We stayed at the El Cosmico hotel/motel. In a patch of desert dirt, clever locals have recycled all kinds of sleeping accommodations, from jungle tents on platforms, to Indian teepees deluxe. Some sleep in Airstream metal trailers, or just any trailer from the 50s and the 60s. This was fun. Outdoor accommodations and campfires everywhere was the closest thing to actual camping, but this is chic-camping with over 25 acres of space around the property, open to dogs of all sizes as well. This is not the overcrowded camping zone by the beach. This is where the fake Prada Store is located. Even though it is called Prada Marfa, it is in fact smack in the desert after the tiny Valentine outpost, a little West of Marfa. 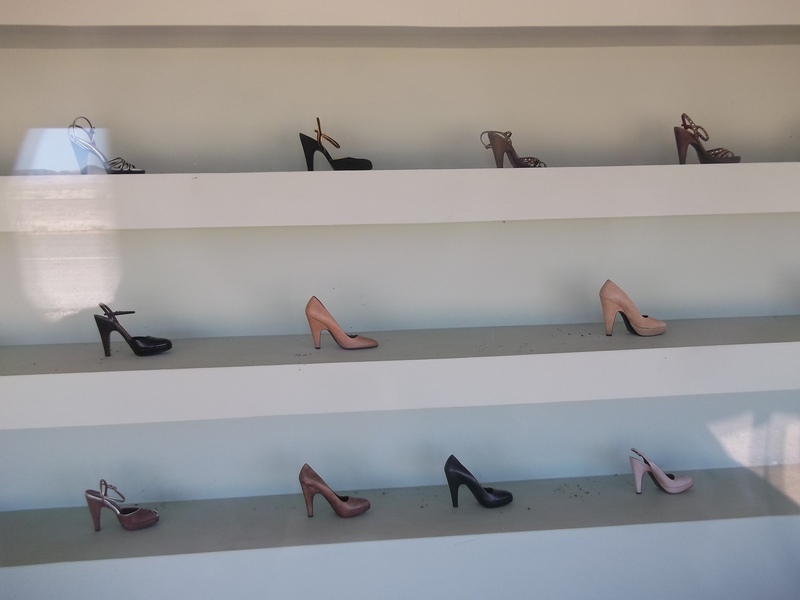 The block store, far away from Italy (home of Prada) as one can get, houses shoes (but only left foot) and designer bags (but with no bottoms) in a single simple room by the side of the highway, among cactus, dirt, and nothing else. This is an art installation, and the people who stop by the side of the road in wonderment at the lone establishment are educated on its presence by a sign next to it. Absolutely everybody takes pictures, because it is so amazingly out-of-place and whimsical that they need to have a proof that they were not in fact dreaming after seeing the high fashion store in the desert. Sort of like a mirage, only this one did not go away as we got closer. Created by Berlin-based artists Elmgreen and Dragset, the "sculpture" of sort is baptized a pop architectural land art project. Made of a biodegradable white adobe-like substance, it is supposed to slowly melt back into the dirt. At the cost of $80,000 (about 40 Prada handbags) it opened in 2005, and is still there 10 years later. Nothing around it for miles and miles makes it odd, and when you see a couple of cars by the side of the road, alongside the dreamy railway tracks, you know for sure you have arrived. The train coming took forever to reach us, and when it was upon us, it took a very long time to pass us, an interminable long time -- this train was miles long. 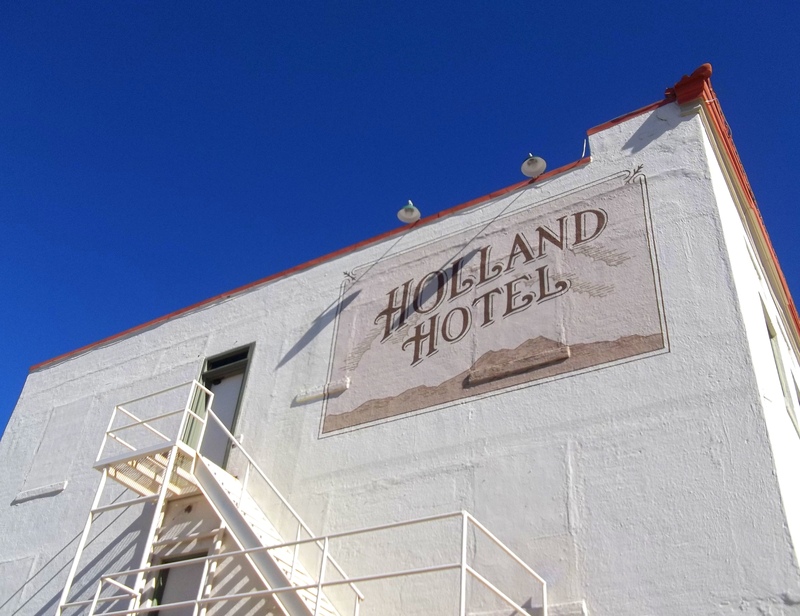 On our way back, we stopped for the night at the adorable Holland Hotel -- a nice reminder from a time where central hotels in pioneers' towns where at once the hotel, the saloon, restaurant, bar, show place, and gambling house where locals and road travelers alike would stop on their way to somewhere. By horse, carriage, donkey, foot, train, coach. We went by car. The beautifully restored hotel has a pool room and a bar, a spa and a restaurant manned by a great chef, the Century. The food was divine, not cheap, but de par with a great restaurant in a big city - - who would have known we find such great food in the middle of nowhere? Red velvet and gold tassels were a reminiscence of special ladies also living in the hotel, to help weary travelers decompress from their tiring trips. Visit my website for more stories.